In order to provide prospective students with the best chance at having a great education, we have compiled this list of the top early childhood education programs of 2018. Some schools may excel at online programs while others may focus exclusively on the traditional, on-campus aspect of higher education. Regardless of the delivery format, these schools excel at providing a quality education for their students. Early childhood education can be an incredibly rewarding field for people who love children and watching young ones learn and grow. Earning an early childhood education degree can qualify you to work with kids between the ages of one and eight in any number of different settings including preschools, church groups, day cares and community centers. Obtaining a degree through one of these early childhood education programs allows talented individuals to take steps towards the career of their dreams with more ease, convenience, and flexibility. Working in early childhood education allows you to help young children during some of the most important formative years of their lives. Helping these children definitely requires the gift of patience and a focus on care, but is hugely rewarding as the children you work with succeed and advance in education well beyond your expectations. Such work allows you to supplement the efforts of busy parents and implement a flexible education and care plan that you tailor to each child’s needs. A career in early childhood education might not be for everyone, but those interested in entering the field need to seriously consider higher levels of education and advanced degrees. Unfortunately, some people are limited by any number of different factors and are unable to attend a college or university in the traditional way. Luckily, the accessibility of online schooling is continually growing and people of all ages and backgrounds can now pursue online degrees from anywhere in the country. If you’re looking for an accelerated course of study, the ability to study while working, or simply want to study from the comfort of your own home, an online degree program from one of the best universities in the nation could be perfect for you. Western Governor’s University is a unique and exceptional school providing on campus and online courses in hundreds of different disciplines. The school, based in Salt Lake City, Utah offers a bachelor of arts in early childhood education of 122 required credit hours. WGU works to make an online education challenging, but very manageable with great resources and student support all at an affordable cost. One unique feature of this university is the capped tuition cost per term no matter how many credits you take. Another interesting fact is that Western Governor’s require students to complete practical application competency testing at the end of the program, which might be intimidating, but ensures competency for such an important field. Casper College is one of the largest and most comprehensive community colleges in the northern United States, located in Casper, Wyoming. The college offers over fifty different degree programs including an associate of arts in early childhood education offered online. Casper currently serves just over 4,000 students. Casper makes the first few steps towards a career in early childhood education accessible, preparing students to continue with more advanced studies in other universities. Valdosta State University is located in its namesake Valdosta, Georgia. The school currently serves a student population of over 11,000 and offers degrees at every level in a wide variety of subjects. For someone interested in pursuing a degree in early childhood education, Valdosta State offers a master’s degree program. The program builds upon previous education in the field and strengthens students with important skills necessary to care for and educate young children. Some of the classes used to develop this skill set include Action Research in Early Childhood Education, Curriculum and Instructional Strategies, Developing Creativity and Critical Thinking in Early Childhood Education and Early Childhood Inclusive Environments. The American College of Education is an institution located in Indianapolis, Indiana with the clear and marked focus on developing future educators of students of all ages. The school is completely online, providing degree programs at all levels, including master and doctorate degrees in early childhood education. The school caters to the needs of online students with its dedication to providing affordable tuition for online education. As a school founded in the digital age, it understands the best way to reach online learners and facilitate the earning of an advanced degree. Trident University International is another university providing master’s education in early childhood education. The Cypress, California school is founded on the belief that a top-tier traditional educational experience could be delivered 100% online through cutting-edge technologies. One unique aspect of Trident is its military friendliness with a large majority of students who have served in the military. Granite State College allows students not only to complete a bachelor’s in early childhood education degree online but also gives students in the program the ability to complete teaching certifications. Specifically, students can become certified in early childhood education and early childhood special education. The college also offers an associate of arts in childhood education for someone looking only to begin their studies in the field. As part of the bachelor’s degree program, students also get to participate in a culminating teaching experience and seminar, allowing students to jump right into their careers. Georgia College was originally founded as a women’s education center in 1889 and now is a center for students with a passion for learning. Georgia College is the state’s only public, liberal arts university and seeks to close the gap between theory and practice. The Early Childhood Education programs teach prospective teachers to prepare content for a field-based approach. Georgia College also offers excellent networking opportunities with cohorts within the program. The University of Wisconsin-Stout is a comprehensive, polytechnic university with a history of providing an array of programs. UW-Stout enrolls over 9,500 students and has a 1:20 faculty-to-student ratio. With over a million students taking online courses each year, UW is dedicated to giving their students the best possible experience with free online tutoring and writing labs and the acceptance of transfer credits. Fort Hays State University is known for many things besides its excellent Early Childhood Education programs. One of the top-notch schools in the nation, Fort Hays is a winner. The university offers online programs for professionals who are self-motivated and independent, using the best technology so students can stream wherever they are. With the ability to stay in contact with faculty and other students, Fort Hays promises to provide the highest quality resources and answers when needed. Clarion University was founded in 1867 and became a college-level institution later in 1920. The Pennsylvania school offers degrees at all levels from associate to post-master degrees. Clarion actually offers three online programs for early childhood education. One certificate level program, one associate’s degree, and one master’s degree. The student body of Clarion is made up of a little over 5,000 students, the majority of which are female. The programs listed are offered in a 15-week format, helping students complete their education at a quicker pace. Florida State College at Jacksonville was founded in 1965 and is one of the most affordable public institutions in the nation. FSCJ offers traditional classes, online classes, and hybrid classes, and even accelerated programs to help students graduate faster. The early childhood education program is rigorous and requires background checks, fingerprinting, and over 150 hours of fieldwork so students can meet and exceed all requirements. Eastern Oregon University is home to the Mountaineers and students relish the small, tightly-knit community. The bachelor’s degree in Early Childhood Education provides students with in-depth knowledge of early childhood foundations, development, and learning. Students will apply this knowledge as they learn to create high-quality early care and educational programs that focus on developing appropriate learning experiences for young children. Marshall University is a renowned school in West Virginia offering a few unique options for online students in early childhood education. First, the school offers a graduate certificate consisting of 21 credit hours. Marshall also offers two options for a master’s degree, both requiring 36 credit hours. The first is licensed PK-K teachers seeking an advanced degree and the second is for licensed elementary school teachers seeking an added endorsement in PK-K. Any of the options comes at a moderate cost and prepares students exceptionally well for the challenges of childhood education. Grand Canyon University is a school in the heat of the desert in Phoenix, Arizona. GCU offers an online bachelor’s degree in early childhood education comprised of 120 required credit hours. Online courses are held in an interactive discussion format, allowing for students to interact with teachers and peers. The school also requires internships throughout the course of the online program, allowing students to gain valuable real-world experience and to learn from experienced professionals in the field. Post University offers two different programs related to child education. The first is an associate’s degree in early childhood education, and the second is a bachelor of science in child studies. One characteristic of the program that is exciting for students with some college experience already is that up to 90 of the 120 required credit hours can be transferred from past education. One highlight of the bachelor’s degree program is the opportunity for hands-on activities and in-field experiences. California Baptist University was founded in 1950 and offers degrees on the associate, bachelor’s, master’s, and doctoral levels. CBU strives to provide a Christ-centered educational experience with 100% Christian staff and faculty. CBU desires to give students an education that takes them on a journey that embraces personal, professional, and spiritual transformation. Their online B.A. in Early Childhood Studies has coursework that will focus on young children’s growth and development including cognitive, social, emotional and perceptual-motor development. Students will also become familiar with various assessments and developmentally appropriate learning environments for young children. Kaplan University offers a unique approach to the online early childhood education program. Kaplan offers a bachelor of science in early childhood administration. This degree not only prepares students for education in early child growth and development and early childhood education but also early childhood leadership and advocacy and business and management. Students benefit from an experienced faculty that is actually made up of professionals in the field. Another unique feature of the program and Kaplan University is that the school employs a tuition cap once you hit a certain amount. Florida International University offers two separate bachelor’s degree options in early childhood education. One is a bachelor of arts and the other is a bachelor of science. The degrees are completely online, not requiring campus visits at all, however, the school does provide constant support for online learners by pairing each student with a success coach. FIU uses technology available 24/7, enabling students to connect with each other, share documents and get real-time feedback from instructors. FIU is an exceptional university providing a program that helps future teachers to focus on every aspect of child development, not just education. Armstrong State University provides great online options for education-related degrees. The school not only offers an online master’s in early childhood education, but also offers online master’s degrees in curriculum and instruction, and reading specialist education. Armstrong State, located in Savannah, Georgia, is the perfect mix of large and small. The school only caters to about 7,000 students but offers over 100 different programs for students to choose from. The wide variety of academic pursuit options combined with a more intimate community feel makes the school a great choice. Kendall College is yet another school in the Chicago area. Kendall actually sits in downtown Chicago. The school has about 1,700 current undergraduate students and offers great academic programs including a top-notch culinary arts education. In the way of education, Kendall offers a versatile bachelor’s in early childhood education that has five different specialization tracks available. Students can choose from Administration and Leadership, Childhood Nutrition, Grant Management, Special Education, or English as a Second Language. Kendall College also offers the option of either a non-licensure track or a teacher certification track for aspiring educators in Illinois. Past college or working experience could save online students time if they attend Liberty University. The online bachelor’s in early childhood education program from this university allows students to transfer up to 90 of the 120 required credit hours. Located in Lynchburg, Virginia, Liberty University actually offers early childhood education degrees at the associate’s, bachelor’s, and master’s levels. For a very reasonable cost, students at any level can pursue an education degree from one of the top online universities in the nation. Campbellsville University is a Kentucky school located in its namesake Campbellsville. The University offers an online master’s degree in early childhood education. Founded in 1906, Campbellsville is a baptist-established institution. The degree can be completed in as little as two years as the program is comprised of 36 required credit hours, however, students may take as long as needed to complete the required courses. Although Bluefield State College offers four different online education-related programs, it only provides one for someone with a specific interest in early childhood education. The bachelor of science in early childhood education from Bluefield is delivered completely online, although options for traditional or seminar course instructions are also available for some classes. The program is a non-licensure track, graduates will not obtain a teaching license, however, the degree prepares students very well for careers in any number of places, working with children. Portland State University also offers a non-licensure program, although it is a master’s degree with a specific focus on inclusive education. Portland State serves over 27,000 students and is the most affordable public research university in the state of Oregon. The school sits right in the heart of Portland and is integrally connected with the vibrant city. The online Master’s in Early Childhood: Inclusive Education and Curriculum and Instruction degree offer students the option of three different specialization tracks, including Constructivism, Infant-Toddler Mental Health, and Early Childhood Special Education. The Vanguard University of Southern California has the mission of developing highly-trained educators with a Christ-centered focus on leadership and service. Both online early childhood education degrees from Vanguard feature semesters made up of two 7-week accelerated course sessions. Online students with some experience can choose the B.A. in early childhood education, while students just beginning their college experience can pursue an associate’s degree in the same field. Both degrees help develop childhood educators to work in both private and public early learning centers. Vanguard University offers a self-paced fully online bachelor’s degree program in early childhood education, preparing students to serve in a variety of roles and settings in the field. Small class sizes foster a collaborative, reflective, Christ-centered learning community where students integrate theory and practice, including field experiences. Students can start and complete their program in any semester. Students may opt for a special education emphasis as part of their BA program, and up to 80 credit hours may be transferred into the bachelor’s degree program. Mercy College was founded in 1950 and offers over 90 degree programs, 40 of which are online. The Early Childhood Education programs are a combination of theoretical and practical studies with fieldwork experiences that are recognized by ACEI and NAEYC. The education college is especially helpful with test prep workshops to make sure students can pass tests with confidence and success. Walden University is another school that has extensive experience in providing online learning options. All online programs from Walden feature flexible scheduling, allowing students to choose when to participate in classes on a weekly basis. Although the class schedule is flexible, the university focuses on student connection and networking between peers and faculty. Walden also excels at providing online student support. The school offers a bachelor of science in child development. The University of Washington is one of the most well-known universities in the entire northwest. With UW, online students are provided with the utmost flexibility, having the ability to watch class lectures and complete coursework on their own schedule. The school also offers academic advisement and technology support services. UW provides a BA in Early Care and Education degree completion program. Students in the program enter with at least 70 transferable credits. The degree prepares students for work in either early education centers or simply raising children in the home. Mississippi State University offers the only online program in elementary education in the state of Mississippi. The bachelor’s degree program from MSU has an available concentration in early childhood education. For students interested in working with slightly older children, a concentration of middle school education is also an option. Paralleling the on-campus program and with courses taught by the same full-time professors, the online degree provides a degree of quality equal to that on-campus. In-field experiences and internships are also an important part of the program with MSU, and students will benefit from this real-world experience. 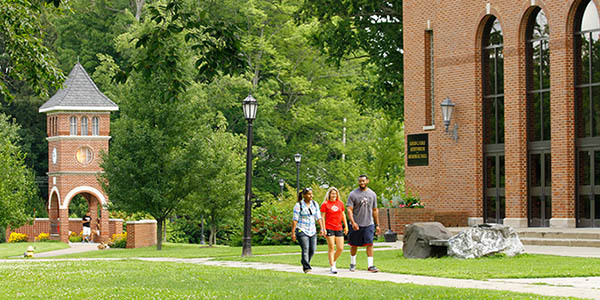 Edinboro University was founded in 1857 and since then is committed to academic excellence and student success. With over 6,000 students representing 34 countries, Edinboro is a diverse community to gain globalized education. Since online courses offer unique advantages over traditional classroom settings, Edinboro offers online degrees to both undergraduate and graduate independently driven and distraction-resistent students. Southwestern College is a high-level educational institution based in Chula Vista, California. The college offers an online Bachelor of Arts in early childhood education. One unique feature of the program from Southwestern is that students are required to take an exploratory education core. Some classes making up that core include Educational Technology and Foundations of Education among several others. Although Southwestern College is one of the most expensive colleges on this list, the program is still one of the most affordable in the country. Southern Union State Community College is a public, two-year institution that was formed in 1993 by merging two colleges. SUSCC offers online programs and helps students learn to be successful in them by teaching them skills like time management, organization, and communication. The childcare programs will help students learn how to design and manage childcare settings which meet the developmental needs, interests and abilities of young children while providing a safe and healthy environment. The school offers some Child Development courses online but their programs are not considered online programs, as you will have to complete courses in a traditional classroom setting as well. Three courses can be taken online and counted towards a student’s degree. Students can take all three classes needed to apply for the CDA credential online at Southern Union State. The CDA is a credential awarded by the Council for Professional Recognition in Washington D.C. The college provides the educational component for students who want to obtain this credential. However, there are several criteria a student must meet in order to receive the CDA credential and Southern Union State only supplies the educational component. Western Kentucky University is one out of four universities in the world named “safe community.” The university enrolls over 20,000 students and was ranked in the top ten best college towns. WKU also offers over 90 online programs, early childhood education being one of them. This particular degree is to develop understanding young children and their needs. As mentioned before, early childhood education can be an exceptionally fulfilling field, allowing individuals to work with children in some of the most important years for learning and development. The schools on this list were chosen and ranked based largely on the affordability of program although factors such as flexibility, a variety of offerings, and program quality were also significant factors in determining the order. If your school is not included on this list but deserves to be considered for an updated version, please contact us today!